After adding the “Feeding an Expired Meter” goal to my list I started to hear that feeding someone elses parking meter may be illegal. Visions of my first mug shot, tattooed cell-mate and steel hand cuffs (not the ones with the fuzzy covers) swirled through my head. How would I be able to explain this one to the family and put a spin on the story so it made me look like a true rebel? Hmm..something was sounding fishy, for the life of me I couldn’t figure out why this would be against the law, except maybe to benefit the cities revenue. Fact or myth? 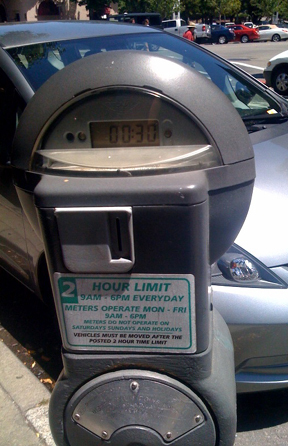 After some research it turns out that it is not technically illegal, but many parking meters only allow a 2 hour maximum, so when you give that car extra time they are exceeding this limit. Ok, makes sense. I was in Mill Valley for the day, hoping to run into Tyler Florence since he’s from the area and just opened a housewares store there. Really, I was just trying to enjoy the weather for a couple of hours before it was back to work for me, seeing Tyler would purely be a bonus and cement the fact that visualization truly works. Upon returning to my parked car, I unexpectedly noticed the expired meter behind me flashing 00:00. Uh..oh, meter expired, what to do? Come on, if you know anything about me by now it’s that I can’t pass up an opportunity to check off another goal on my list. I dropped in a quarter and gave them another 30 minutes to get their butts back to their car. Have you ever fed an expired meter? Never though of adding this to my bucket list before, I will definitely be adding this to my own bucket list now though. I have to say that it is nice to see that someone is looking out for others. I believe that this is something that I will have to add to my bucket list and if I can ever find gainful employment again, I will start living out my bucket list. After all, we only live once.